In my last review, I compared Annihilation (the first book in the Southern Reach trilogy) to the first season of Lost in that it sets up a strange mythology and throws a lot of questions at you without providing anything in the way of answers. Unfortunately, Authority, is like the next few seasons of Lost–where instead of beginning to resolve any of those questions, it just keeps pummeling you with more and more complex mythology. I didn’t reach a breaking point by the end of the book where I just didn’t care anymore, but I’ve come close enough that a lot depends on the first few chapters of book 3. If answers aren’t coming quickly, I’m probably out. In Annihilation we followed a mysterious government agency’s twelfth expedition into the mysterious Area X–a region that had become separated from the rest of the world by a mysterious border. Things didn’t go so well. Now, in Authority we find ourselves on the other side of the border, inside the Southern Reach (the government agency responsible for studying Area X and sending in the expeditions). John Rodriguez, AKA Control, is the newly appointed Director of the Southern Reach and our narrator. He is charged with getting to the bottom of what happened to create Area X–a mission no one has succeeded at so far. But the Southern Reach may be collapsing in on itself rapidly–and Control has no idea who he can trust. Another problem with Authority is that Control is presented to us as a fixer, a man who has bounced from assignment to assignment because he’s really good at going into a place, diagnosing the issues, and course-correcting. The problem with his career is that he isn’t good at long games. Or at least, that’s what we’re told. I don’t know if this was intended to be one of those cases where our narrator is unreliable (Vandermeer is extremely fond of this–perhaps overly so), but it is almost immediately apparent that Control is laughably inept. Every conversation he has is bungled and results in him losing ground in his investigation. Perhaps we’re meant to believe that he is being overly hard on himself, but I don’t think so. Perhaps Vandermeer thinks the plot will be more tense if Control has more ground to make up, but the only result is that by page fifty you have astonishingly little faith in his ability to sort things through. 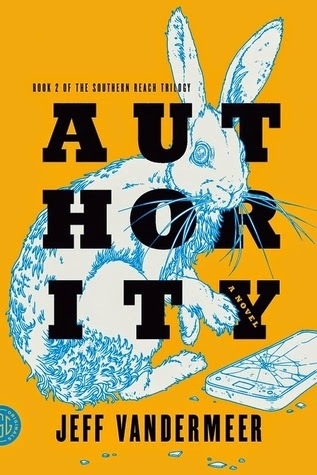 Authority isn’t a bad book, but the protagonist is frustrating is disappointing. So is the way the Southern Reach trilogy’s mythology becomes so hopelessly convoluted. I don’t even know if it’s possible for Vandermeer to adequately explain everything in book 3. But I am committed to finding out. For now.